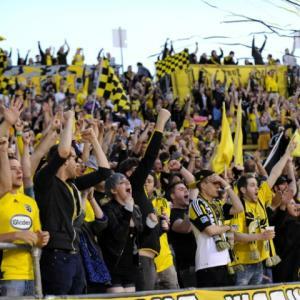 The nights are getting cooler but the fans were blistering hot when I went to the Columbus Crew game. I had no idea how fast paced this game would be! This team’s athletic ability was amazing and their stamina something I have never witnessed in any sport in my life. I was lucky enough to be able to go into the lobby of the executive offices to see the MLS trophy which the team won in 2008. The game is something I will need to study, sadly, I do not know anyone who had played soccer in school so will have to make new friends. Some I met last night waiting in line for the $1.00 Brat and $1.00 beer night. Everyone was willing to help me when I asked the “stupid” questions about the game while they were watching. Thanks to everyone who helped. I know I will have less questions and more knowledge for my next game. There&apos;s still a lot of season left! Grab tickets for the last three home games: Sept. 21 against Chicago, Oct. 5 against Kansas City and Oct. 27 against New England!